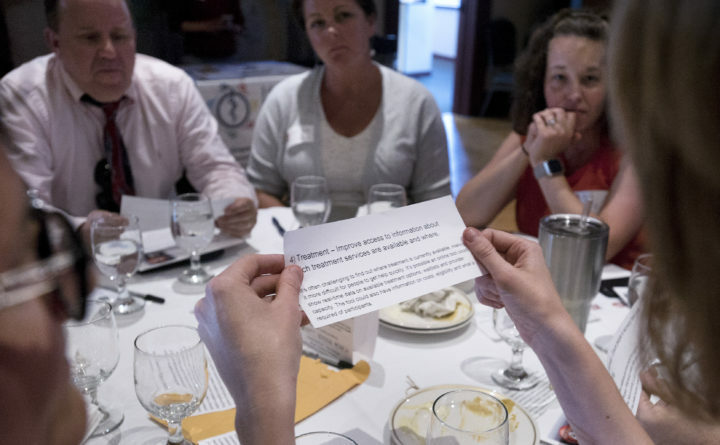 Nearly 100 people gathered in Bangor on Wednesday evening and decided preventing drug use should be the next priority the region pursues to address the opioid crisis. At the state level, they said the next priority should be bolstering funding for treatment. The Bangor Daily News hosted the One Life Project: Public Priorities event at the Bangor Arts Exchange ballroom to get a sense of the most urgent and well-supported initiatives for tackling opioid addiction, involve the public in discussion about a key issue in advance of November’s election, and provide a chance for the gubernatorial candidates to listen to what matters to Maine people. Independents Alan Caron and Terry Hayes, and Democrat Janet Mills participated in table discussions where attendees talked about nine regional initiatives and eight state initiatives, and then voted for their priorities. Republican Shawn Moody’s campaign manager, Lauren LePage, also participated. Each attendee had three votes; they could cast all their votes for one initiative or spread them out. 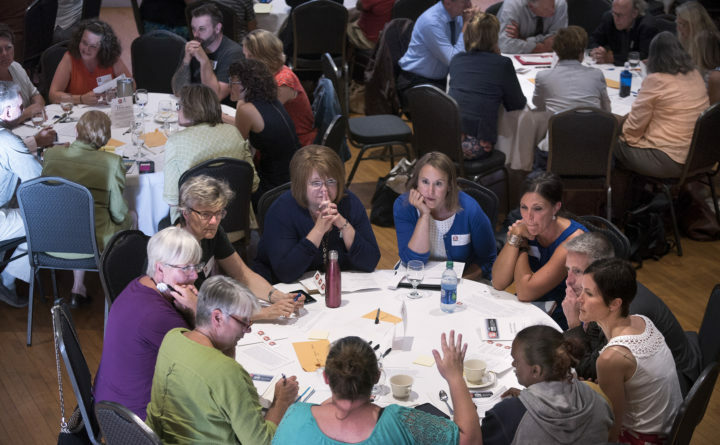 The Community Health Leadership Board, a collective of leaders of area health and social services organizations, will consider these priorities in deciding what to tackle next. 1. Develop a local approach to preventing youth drug use, and ensure focus and sustainable funding: 62 votes. 2. People need support beyond initial treatment: 53 votes. 3. Expand access to treatment: 52 votes. 4. Continue work to reduce stigma: 40 votes. 5. Work within the criminal justice system to get people with substance use disorders help: 29 votes. The criminal justice system is on the frontlines of the opioid epidemic. Law enforcement officers should be able to connect those who have overdosed with treatment, not arrest them. County officials should work with the community on a plan that allows the Penobscot County Jail to continue inmates’ prescribed anti-addiction medications while behind bars, and connect them with treatment help upon their release. (The jail and Penobscot Community Health Care have already begun work with a Vivitrol program.) Courts should ensure that probation, bail and drug court conditions are based on medical assessments. Judges, attorneys, law enforcement officers and jail staff should have access to ongoing education about addiction. 6. Expand access to naloxone: 22 votes. 8. Continue to reduce opioid prescribing: 9 votes. 9. Address provider recruitment, shortages, retention and burnout: 5 votes. 1. Bolster funding for treatment: 70 votes. 2. Ensure people in recovery have safe housing: 45 votes. 3. Develop and fund diversion programs to connect people with treatment and recovery services instead of putting them in jail: 40 votes. 4. Help jails treat inmates: 21 votes. Treating inmates would involve developing and funding services in jails to address mental health and substance use disorders, including medication-assisted treatment, and connecting inmates with treatment in the community upon their release. It would also involve the creation of a permanent advisory board to help facilities keep up with best practices on treatment and programming. People lose Medicaid coverage when they are incarcerated, leaving Maine counties and the state to pick up health care costs. As a result there is virtually no medication-assisted treatment in Maine jails and prisons, though it has been successfully used in other states and has lowered reoffense rates. It is also important to connect people with treatment in the community upon their release as studies have shown that people who are newly released have a greater risk of overdosing. 5. Develop a strategy to prevent drug use: 18 votes. 6. Reduce diversion of opioids: 13 votes. Diversion, which is when legally prescribed drugs are used for illicit purposes, contributes to the opioid epidemic. About 80 percent of people who use heroin first misused prescription opioids, according to the National Institute on Drug Abuse. A state law has already forced prescribers to limit opioid doses, but the state can do more to increase and promote prescription drug take-back days, alternative drug disposal options, and drug-collection boxes at police stations and other locations. It can also require pharmacies to give patients information on how to dispose of excess medication. 7. Improve access to information about which treatment services are available and where: 8 votes (a tie). 7. Fund and expand the use of specialty courts across the state that connect people to treatment and other services: 8 votes (a tie). — Have businesses post stickers saying “naloxone available here,” similar to the approach with automatic external defibrillator devices. — Bring in more youth to Boys and Girls Club. — We need access to treatment in emergency departments. — Expanding access to treatment in emergency departments would require significant training and additional dedicated resources to make sure it is done well. — The state should use its bargaining power to purchase low-cost naloxone. — The state should fund health centers in Maine to provide integrated care inside jails. — Medicaid should cover people in prison and jail. — Put tamper-proof prescription take-back boxes at more locations, such as at city hall, hospitals, pharmacies, fire departments and police departments.